Fabulous creations! They look like they had a lot of fun with these kits. You all did a fantastic job! I love seeing all the creativity! 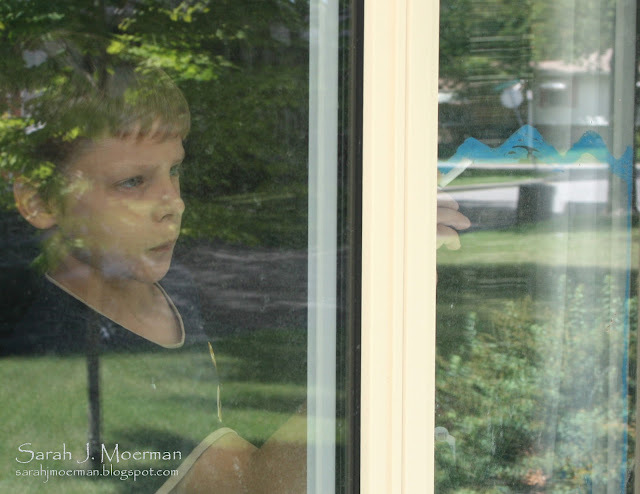 Imagine the fun you could have drawing images on windows, with images already outside the window. Wow! You are some amazingly creative people! You must have a lot of fun doing crafty projects with your mom. I love all your bright colors and great imagination. Way to go! Glad you're having fun. 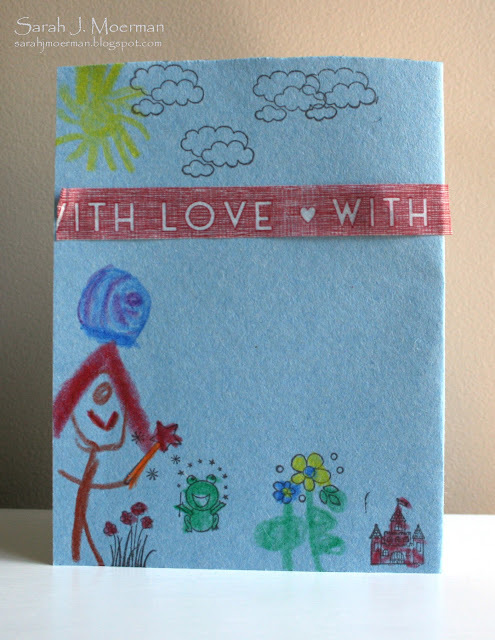 Wow your sweet kids are adorable, I say have fun and enjoy crafting because you definitely did a great job!!! Your kids are so cute Sarah! I love how they each could get creative from the one kit! Your children are very creative artist! Wonderful works of art, each and every one. Seeing kids art always puts a smile on my face. It's almost like a window into what they are thinking. What talented kids. They all did a great job on their project. Thanks for sharing. 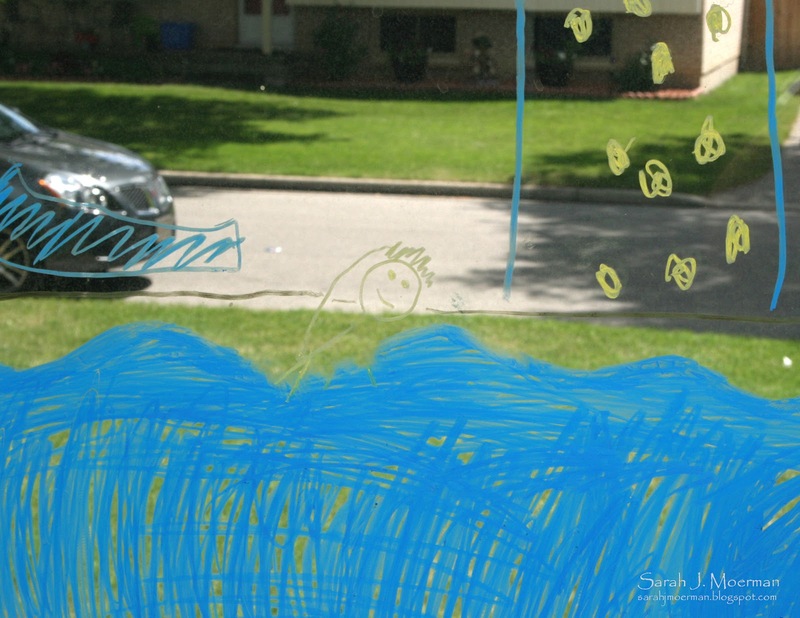 Jaden...loved the pool picture you drew on the window (like how you hair is spiky). Chris..love how the star is bursting out of the card. Zachary...great colouring of the picture it really summery. 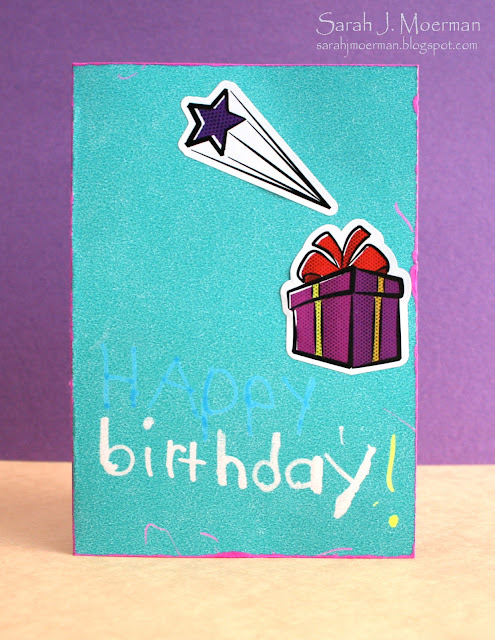 Janelle...you did a great job with so many pretty details on your card. This kit looks like a lot of fun...thanks for sharing. WOW, kids, you are so good at creating... love your projects and hope you had a lot of fun at doing them!!! Way to go!!!!! You're all such great artists with your own unique styles - keep up the crafting! Love seeing your kids enjoying the Jr. Kit. What fun! Very talented kids. Bet you're a proud Mom. Oh, I would love to paint on window myself! You all did such a fantastic job! Beautiful projects! and so creative!! Zach- your card is exploding Happy Birthday I think gifts are the best part of the day too! Janelle- I can tell you are a trending card maker you have that washi tape strategically placed over the magical kingdom I love your frog too! How cute! I love the SSS push to get kiddos crafting more. I've always had my charges doing crafts & such-seeing what they make is like a little peek inside their brain. Love what your kid came up with! This is awesome!!! 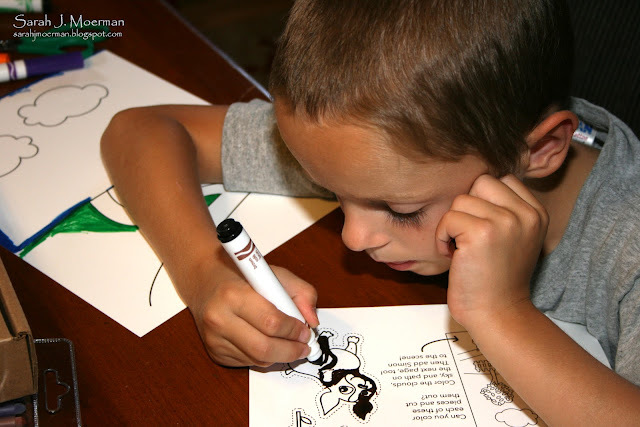 I love this kit and I love how all of your kids found great uses for it! so cool! looks like everyone had a ton of fun. Wonderful job by the kids!! Looks like they were having a blast! You guys are all so talented! I'm really impressed. Awesome creations! Loved seeing you enjoy yourselves so much! I loved seeing all the wonderful creations and explorations! I hope you enjoy creating more and more! Thanks so much for sharing so other kids might get a chance to get a kit of their own!!! What fun! I'm sure they will have hours of fun with all these goodies! TFS! I love how each of the kids had their own ideas of what they wanted to create and just did it! Fabulous jobs kiddos! Awesome kit! Thanks for all the demonstrations...keep going and have fun! God bless! GREAT swimming window graphic Jaden! Chris, your card looks fit for a SUPER HEO! I really like the sunflowers in your picture. Janelle, your card looks like a fairyland!..Is the frog going to turn into a prince? Looks like they had fun with the kit! Great projects! Fabulous creations! Well done! I love how you've all made different creations using different supplies. You're one creative bunch. Wonderful creations of wonderful crafty kids! Great job! Keep on crafting! I am sure loving all these pictures of crafty kids lol. It looks like you are working hard and having fun being creative! Great job on all your projects! Wow you kids are realy great crafters. Impressed when I saw what you made. It's super fantastic terrific great! I love the proncess that's going to kiss the frog, and then live happily ever after in the beautiful castle. And that swimming(or is he drowning;-)) boy on the window, perfect drawing job. That birthday card appears to be made with really crafty hands, beautiful. 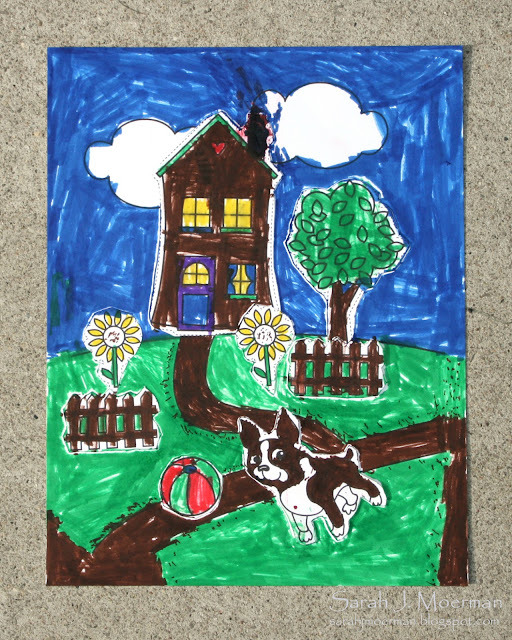 And I love the coloring on the drawing with the playful dog outside the house. These cards rock. Love all the creativity. Would love to frame these and have them hanging in my creative space. Thanks for sharing. very creative...keep up with the excellent work! I love the inclusion of the window markers in the kit. 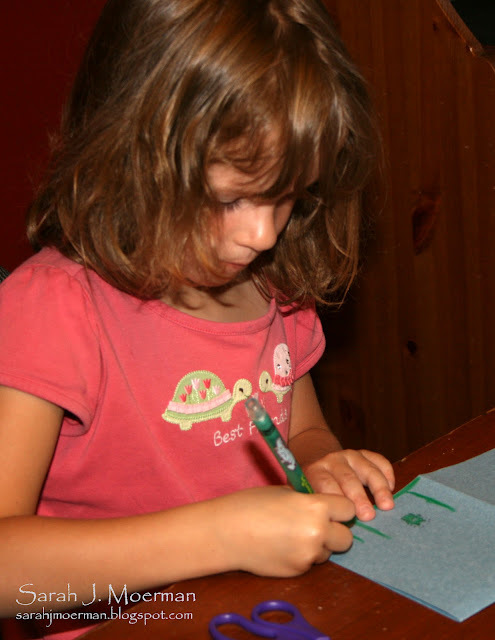 Sure, paper is great to craft on, but sometimes it's nice to get off the page!